Just four days after gracing us with a new trailer for Spider-Man: Into the Spider-Verse, the film’s producers, Phil Lord and Chris Miller (The Lego Movie) took the stage at New York Comic-Con today to screen the first 35 minutes of their animated Spidey romp. 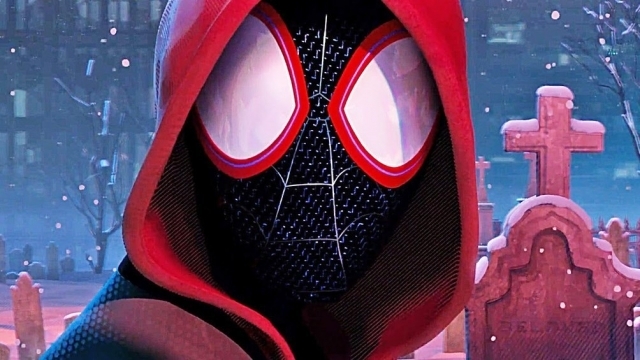 According to Entertainment Weekly, Lord and Miller first made the audience stand up and repeat after them: “I promise not to tell any Sony executives that I saw this.” Before showing the footage, the pair warned that the animation was still rough, but the crowd at Madison Square Garden was nevertheless wowed by the film’s unique visual interpretation of the spider-powered characters that make up its cast. We now have a few more story details as well, including how the Kingpin’s mishandling of a Super Collider opens up a window to Miles Morales’ universe. That leads to the proverbial meeting of the spider-minds that sets the film’s plot in motion. In Ultimate Universe comics, the Peter Parker of Miles’ universe was dead. The same is true for the movie, so you can imagine Miles’ shock when he runs afoul of Jake Johnson’s older, grizzled Parker. It’s the cemetery scene that we glimpsed in the film’s first trailer. Shameik Moore could barely contain his excitement about getting to play Miles Morales’ Spider-Man in his first cinematic outing. As EW reports, the actor went so far as to express this desire in his journal while filming 2015’s Dope. “When I was younger and I first saw Miles Morales I was like, ‘Dude, it’s a black Spider-Man,” he said. “I def want to play the black Spider-Man one day.” Beyond cultural significance, however, the filmmakers are promising to include plenty of humor that calls back to previous incarnations of Spider-Man. Yes, that also means the infamous dance number from Spider-Man 3. More importantly, they want to carve an original niche for a character who’s had more than one go-round at the multiplex over the last two decades. “We just set out to make the most different Spider-Man movie we could,” said Lord. Spider-Man: Into the Spider-Verse swings into theaters on December 14. Are you excited for this new take on the characters? Let us know what you think in the comments below!